As the largest network of public theatres in Europe, the ETC has more than 40 European Member Theatres from over 20 countries, reflecting the diversity of Europe’s vibrant cultural sector. Founded in 1988, the ETC promotes European theatre as a vital platform for dialogue, democracy and interaction that responds to, reflects and engages with today’s diverse audiences and changing societies. 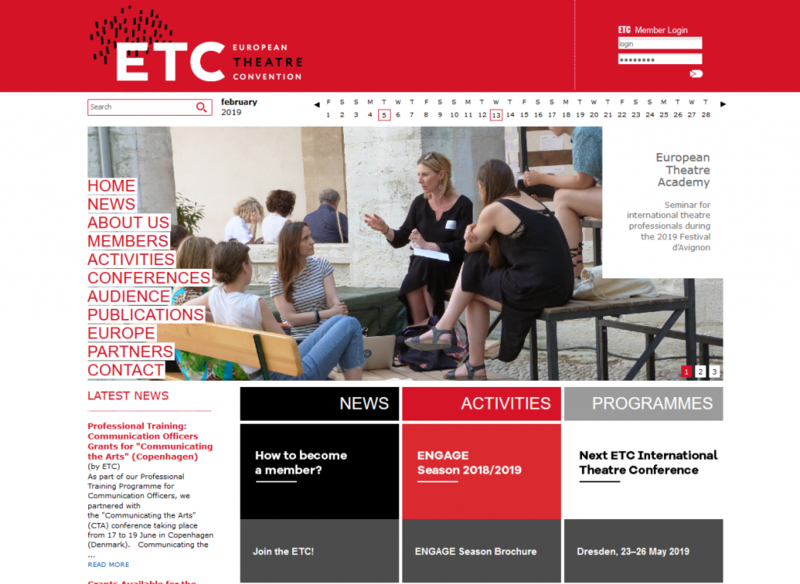 ETC fosters an inclusive notion of theatre that brings Europe’s social, linguistic and cultural heritage to audiences and communities in Europe and beyond. Powerful and professional ETC governance ensures that the network will thrive and grow, taking into consideration the latest trends and developments. The ETC’s current four-year ENGAGE programme offers our members many opportunities and project possibilities. This comprehensive, groundbreaking programme is supported by the Creative Europe programme of the European Union.